Abu Dhabi’s F1 track is opened to the public three nights a week for TrainYas – Sundays, Tuesdays and Wednesdays (the latter is ladies’ night). The track is 5.5km long and you get free water here, and there’s bike shops, too. Most importantly, you can borrow bikes (plus a helmet) from the Cleveland Clinic stand. Registering in advance for a pass online is recommended – it’ll save you queuing to get in on future visits. The capital’s newest cycle track opened earlier this year and features two loops, one 5km long, the other 10km. The route has coastline views of the ocean and the city’s skyline. Yas Cycles has a small shop here where you can rent a bike, plus there’s changing rooms, showers and vending machines selling bottles of water. Dubai’s motor racing track is open every Wednesday evening for cycling – TrainDubai runs until 9pm and you get to ride 2.5km of the facility, and you can also rent a bike here and buy water. The loop here is almost 9km long and the views of Dubai’s skyline, including the Burj Khalifa, are pretty impressive. You’ll often find cycle club rides taking place here as well. There’s showers and toilets and also a mobile bike service shop on hand on many nights. Dubai’s sprawling network of cycle routes in the desert just gets bigger – it’s now almost 230km long. Trek have a store here, where you can rent a bike, and there’s toilets and showers plus a café, and you’ll also find plenty of food trucks – it’s also home to a branch of Last Exit. There are no street lights, so if riding at night, you’ll need good lights (and you’ll need to be mindful of the local wildlife, including gazelles). Abu Dhabi’s facility is a 45-minute drive from the city centre – you’ll find 96km of track here, with 8k, 16k, 20k, 22k and 30k loops, meaning it’s good for cyclists of all levels. There’s an ADNOC shop selling food and drinks and coffee, plus toilets and showers, and BeSport have a small store as well, where you can rent bikes. The garden city now has a 23km track. Facilities are non-existent, though. There’s a car park, but no toilets and no shops. But there is an ADNOC around 3km from the end of the track, should you need to make an emergency pitstop. All over the capital are designated cycle paths – you’ll find them on Saadiyat Island by the Louvre, on Yas Island, the Corniche, in Al Bateen, Khalifa City and on Al Maryah Island, to name a few places. And the best way to explore them is on a Cyacle. 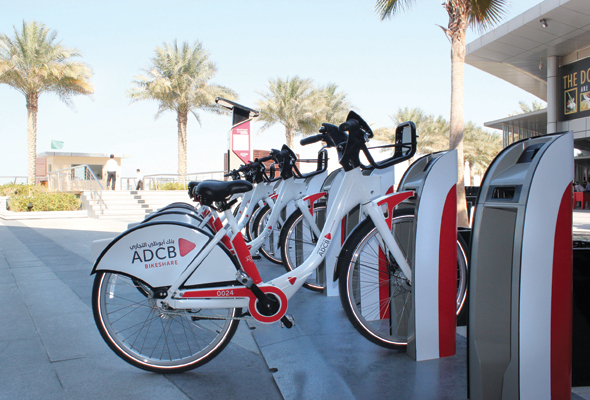 The big white bikes are Abu Dhabi’s bikeshare scheme – you can rent them for an hour at a time, as long as you return them to a docking bay within an hour (once docked you can book another hour and carry on). You’ll find cycle paths in Al Barsha Park and Mushrif Park, while there’s a 2km track along Jumeirah Beach. The Dubai Water Canal is also home to a 12km track. If you don’t have a bike, you can rent one from Byky. They have 85 rental sports all over the UAE, including in places such as Deira and Palm Jumeirah. They also do four-wheeled bikes and pedal-powered mini-cars for kids. You can rent a bike for up to 24 hours. The UAE’s oldest cycle shop (it opened in 2002), you’ll find Wolfi’s on the Sheikh Zayed Road and they stock mountain bikes, road bikes, triathlon bikes and kids’ bikes. They sell kit by some of the top brands in the world such as clothing label Castelli, plus wheel makers Zipp and Lightweight. When it comes to bikes, they stock US brand Scott, Canadian brand Cervelo and German brand Storck. 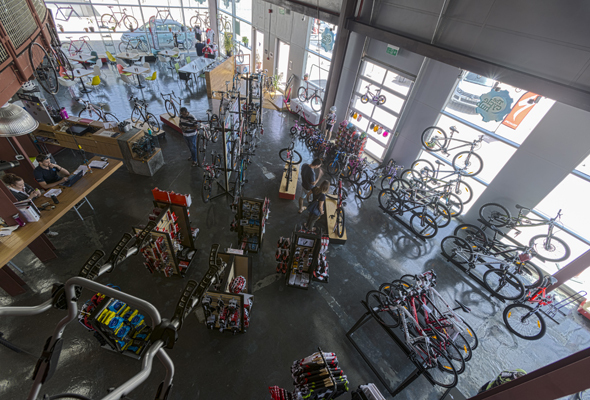 Situated in Dubai’s Motor City, The Cycle Hub sells top brands including US bike makers Specialized, Italian firm Pinarello (Team Sky ride their bikes, including multiple Tour de France winner Chris Froome) and clothing brands including German kit manufacturers Maloja and bike computer company Garmin. The Cycle Hub is also home to a café that only serves paleo dishes. Another store with a long history in Dubai, Revolution sell bikes by French brand Look and Spanish brand BH (both mountain and road in the latter), and clothing brands such as Vermarc and Louis Garneau. They’re also the folk behind the Dubai club Cycle Safe Dubai. Abu Dhabi’s most popular bike shop, they also sell Specialized, Cervelo and Colnago bikes, plus Belgian brand Eddy Merckx. They stock Globber scooters for kids, and have two branches – one at Al Zeina and another at Al Hudayriat Island. Like all the bike shops listed here, they sell some pretty hi-tech kit, including power meters by Stages (these devices let you measure your effort by watts, as well as speed, and are a vital training tool for serious cyclists). With branches in Dubai and Abu Dhabi, HQ are known for their climbing walls and camping equipment. But they’re also a bike shop, with mechanics in each branch and brands such as Swiss company BMC. They have heaps of kids bikes as well. Italian cycling company Bianchi are one of the oldest bike brands in the world – and you don’t have to spend a fortune to get a good one in the UAE. This aluminium model, the Via Nirone Alu, is great for beginners and comes with 18 gears for Dhs5,995 and its fork is made of carbon. Whether you’re a newbie or an experienced rider, getting the right bar tape can make a big difference to your cycling. Supacaz’s tagline is ‘no more gloves’ because their bar tape is so supportive it reduces vibrations from the road you feel through your handlebars. You can get it at Stage 2, a new bike shop at Yas Marina Circuit, in a variety of colours. A bike computer can help you improve and tells you data such as how fast you’re cycling, your average speed, your cadence (how many times you’re spinning the pedals per minute) and more. This one is well priced if you’re after your first computer. This one is really aimed at more experienced cyclists, as it’s a 206km ride from Sharjah to Fujairah, taking in plenty of climbs as you pass through Hatta. New for this year, there’s a 140km option if you don’t think you’ve got the legs for the full distance. 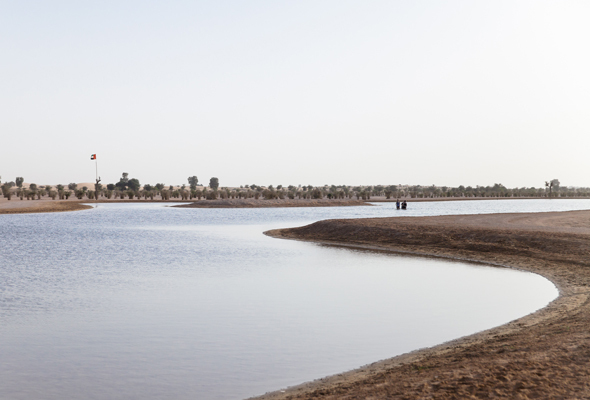 The oldest organised cycle ride in the UAE, there’s two distances here – the full 92km and a 53km for less experienced riders. You’ll cover the streets of Dubai and start and finish at the Autodrome in Motor City. You need to be able to ride at an average speed of 26kph to complete the 92km ride. There are build-up rides for this one taking place at Al Qudra on October 5 and 26 and November 23. Regarded by many as the best event in Abu Dhabi simply because of the terrain – you’ll cycle from and to Tal Moreeb, Liwa’s gigantic sand dune. It’s a tough route, with lots of hills to go up and down. There’s a 100km course for more experienced riders and a shorter option for those of you who are new to the sport. Fancy riding your bike somewhere different? Ride Ajman is a 115km race through the small emirate, and there’s a 58km version as well. A huge pot of prize money is being offered for this one, totalling Dhs84,000. It also comes with full road closures so you can ride your bike without a car in sight. If you’re keen to take a bike off-road, then head to the Hatta Mountain Bike Trail Centre. You’ll find 50km of challenging trails here, although the facilities are aimed at both beginners and expert cyclists (routes are graded in a similar way to pistes at a ski resort – green, blue, red and black, with black being the toughest). The centre is free and open all year round.